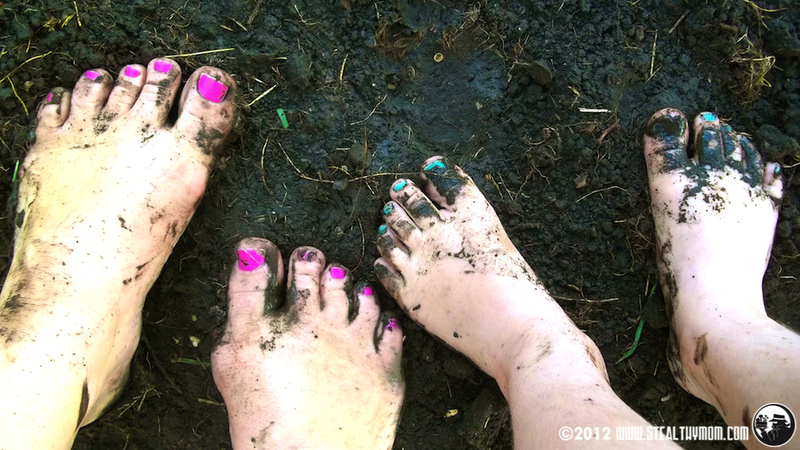 Stealthy Mom: What can you learn from a patch of dirt? What can you learn from a patch of dirt? Everyone should have the opportunity to plant a garden, even if it is only a small rooftop garden or a balcony pot. This year, a guy up the street was driving around making a little side money with his tiller, and the boys were so excited to watch him dig up part of our front yard. Their Daddy and I emptied out the composter and we all grabbed various tools- including a little plastic rake for the Cadet- and worked a year's worth of kitchen scraps and leaves into the big patch of muck. We officially became gardeners on a small scale. There is something about getting dirty and experiencing the process of growing food that cannot be learned (or felt) in any classroom, from reading books or watching TV. (Teachers out there might cry foul because they had their kids plant seeds for a "lab" experience. I did that, too, when I taught outside the home, and in university got to do some pretty neat stuff in a greenhouse. Nope, not the same, unless you can stick with it from dirt to food and back to dirt again. ) It had been decades since I had been involved in growing food myself, so it was as fresh for me as it was for the boys. Basic Biology and Geology: What do roots do? What do leaves do? How did the seed or tuber become a plant? What do plants need to grow? What are the basic components of soil? Where does rain come from? Of course, each of these questions could take up a PHD thesis, but have simple answers for a preschooler, too. Patience: Some seeds take weeks to poke their solar panels (cotyledons) up through the soil surface. Others take just days, but the weeds quickly outgrow them. There are the plants that become huge but do not produce anything edible until after they flower and go to seed. Then there are the perennials and trees that can take years to produce a crop. Nature has no fast-forward button. Habitats: Spending time in the garden, we have seen beetles, spiders, worms, bees, birds, squirrels and even a snake. While the front yard was already a habitat, we pay closer attention to what else lives in and visits the yard when we are out there. We listen to crickets, cicadas, and tree frogs in the evening and watch for bats to swoop out to eat mosquitos. Humans are Part of the Ecosystem: Now that the kids are trying to grow food, they take notice when people throw trash out their car windows or when debris from former owners years ago works up through the soil. When we take walks they like to carry a bag to pick up after litterbugs. They understand how bees and other winged things help pollinate the garden and don't want to hurt them with chemicals. The boys love to forage for edibles and pick wildflowers in the lawn and can see that the "pretty, all-grass" yards in town are not nearly as interesting. They can also see how those conventional lawns have fewer butterflies and bees. At our house, there is a four-year-old and a two-year-old who are getting it. So far, we've got beets and will have an explosion of zucchini any day. The sweet pepper seeds did not come up, and it might be getting too hot for the potatoes. If this heat wave continues and our herbs don't make it, that will be okay. What we are learning from the yard is more valuable than the produce itself. I shared this post with Friday Food Flicks, the Weekend Whatever, Wildcrafting Wednesday and Empty Your Archives (science experiments for kids). Yup! I agree. We are getting back to the basics at our house. The kids are learning so much about gardening. If we only harvest a little bit it is a success. There is much for them to learn and the life lessons learned during this time are "real". Learning to work, and wait for good things is where it is at. I can't wait to take my daughter out into the garden this summer. She will be one, and it's never too early to start! Thanks for sharing this on Wildcrafting Wednesday!